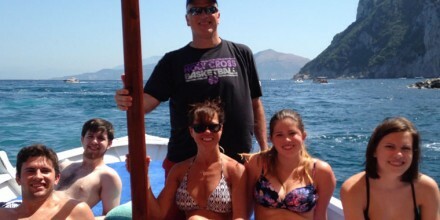 Booking this organized tour to Capri will include a local guide with whom you will all spend a Caprese day together. In Anacapri you can visit Villa San Michele, home of the writer and Swedish doctor Axel Munthe. In addition, you can take the chairlift and reach the top of Mount Solaro, the highest point of Capri where you can admire spectacular views over the entire Gulf of Naples, Sorrento, and up to Ischia and Procida. In Capri, you may anticipate a stop in the legendary Piazzetta for a coffee and a chat in one of the historic bars of Capri and a visit to the Gardens of Augustus, from where you can enjoy a postcard view of the sea and the Faraglioni. For excursion by sea, we offer a one-hour tour of the island with a visit of the Blue Grotto (optional and time permitting) the cave is only open if the sea is calm and not windy. The famous convertible Caprese Taxi, especially built for the island,is white on the outside and colored inside, with a typical awning. Relive the most famous film scenes shot in Capri! The Caprese Taxis can accommodate up to 6 people. Wooden boat, with a sundeck. On board you will find fruit and champagne, towels and snorkeling equipment. At the helm of the boat, is the captain’s quarter, obviously Caprese: a true man of the sea! The funicular, the typical red train, connects the port of the Marina Grande to the center of Capri in just 4 minutes. You will find it right in front of the pier of the arrivals, while the ticket office in on the right. Small buses in Capri connect Marina Grande and Anacapri, via the road along the sea for a spectacular view, which is called “Mamma mia Road”. 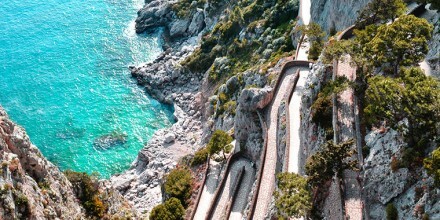 Walk suspended between sea and land along the most beautiful scenic trails of Capri with an expert guide at your side. There are three levels on which Capri extends and three ways to visit it: by sea, by land or by both combined.